Interested in improving the appearance, value, and functionality of your home? Then count on our reputable flooring store for high-quality laminate flooring. We are proud to offer an extensive array of laminate floors, as well as professional laminate flooring installation services. Our laminates feature a seamless blend of functionality and style. With laminate tile flooring and laminate wood flooring, you can achieve any look you want for your home without any inconvenient maintenance. Known for its durability, laminate floors are easy to clean and increase the overall value of your home. Come by today to see our showroom and find something that catches your eye. Our trained associates are happy to help you find the right flooring that suits your needs and personal décor style. 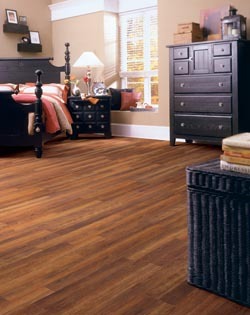 We can also walk you through the laminate flooring installation process while you are here. Whether you appreciate a more modern look or a classic appearance for your home, the versatility of laminate flooring makes it a perfect choice. The material comes in a variety of textures and appearances. Its smooth surface makes it a breeze to clean, and its four-layer construction allows it to stand up to heavy foot traffic. Laminate floors provide limitless value for your home. Our products bring an unsurpassed aesthetic appeal to every room in your house, while also providing a level of durability that is perfect for heavy foot traffic. Our specialists help you choose the exact style that matches the ornamentation of any home as well as your specific lifestyle. HomeCraft™- This brand offers a varied selection of laminate flooring surfaces and styles. Ideal for first-time homebuyers or anyone seeking attractive flooring, HomeCraft floors provide long-lasting performance for every room in your house. Mohawk™- When you are looking for healthy home certified flooring options, Mohawk is one of the leading companies to provide eco-friendly products. Their professionals promise customers to provide the highest quality laminate wood flooring products that meet strict U.S. guidelines. They have been a recognized name in the industry for 130 years and continue to build innovative flooring designs. Pergo™- When it comes to finding durable and beautiful flooring, Pergo's products stand out. Their sleek laminate collections include a wide range of styles, textures, and colors. They bring superior wear performance that is resistant to most stains, scratches, and impacts. Shaw™- Shaw's patented locking technology provides a secure installation of laminate flooring panels on all four sides without the use of an adhesive. They have developed this single-action locking system to make installing new floors a breeze. This system provides a more reliable solution than those that use glue. Armstrong™- For more than 150 years, Armstrong has prided itself on selling high-quality flooring with integrity. Its laminate flooring products meet or exceed all environmental, health, and safety requirements to ensure your home is safe for children and pets. Available in a stunning selection of shades, styles, and designs, Armstrong laminate floors make a beautiful and durable addition to any house. When you turn to us for laminate flooring, you also have access to our professional flooring installers. Our contractors have extensive knowledge of our products and how they are constructed to execute a quality installation job. Their experience in the field has prepared them to provide laminate flooring installation efficiently and quickly as well. You can also trust in our Price Protection Guarantee and Ultimate Confidence Guarantee to ensure your new flooring will completely satisfy you. Visit us today to see what we have to offer you. Contact us to learn more about our laminate floors. We proudly serve customers throughout Feasterville, Holland, and Southampton, PA, and the surrounding areas.